THE WIND BLEW, THE LEAVES FELL, AND A TINY SEED HID IN THE GARDEN. "BOO!" SAID THE SEED TO A LEAF. The leaf snickers and finds Little Boo not the least bit scary. on a passing grub, with the same results. Then the snowflakes started to fall. They are not intimidated by Little Boo either. "THERE'S MORE OF US THAN THERE IS OF YOU!" THEY BRAG. "IT'S NOT TIME TO BE SCARY," SAYS THE WIND. "I WANT TO BE SCARY NOW!" LITTLE BOO INSISTS. But winter will have its way, and the little seed sleeps through the cold months. Then suddenly he wakes as a little green sprout ready to try out his boos on the spring butterflies--who are not flustered either. As the soil warms and the sun shines down. Little Boo becomes a bright orange blossom, blowing sweetly in the spring breeze. who laughs at his boos, along with the shovel and the watering can. But soon he grows into a green pumpkin. And as summer wanes, the chill wind returns to see that Little Boo is now a big orange pumpkin, ripe for the picking. And on Halloween Little Boo is big--a big, glowing Jack o' Lantern. "GOOD SCARING!" WAILS THE WIND. 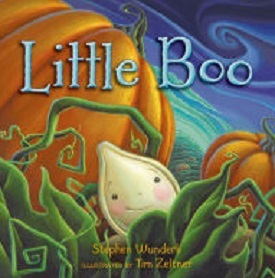 Stephen Wunderli's new Little Boo (Henry Holt and Company, 2015) is a shining new addition to picture book stories for the scary season. For an autumnal tale, this one has it all--a lesson in the life cycle of a seed and the cycle of the seasons, a poignant when-will-I-be-big premise, and a Halloween hook that will keep children captivated until Little Boo finally gets his own chance to shine! Artist Tim Zeltner's glowing acrylic paintings, done in full-bleed two-page spreads and spot art on wood shine bright as well. It's not easy to imbue a pumpkin seed with as much personality as Zelter does with his emotive little protagonist, but in this story author and illustrator blend their talents into perfect read for a primary grade October unit or story circle. Pair this one with Margaret McNamara's evergreen How Many Seeds in a Pumpkin? (Mr. Tiffin's Classroom Series) (read my review here) for a cross-the-curriculum story and project that almost teach themselves.